Hawthorn – Dig Delve – An online magazine about gardens, landscape, growing & making. It has been a good year for the hawthorn. It is foaming still up the hedge lines and cascading out of the woods above the stream at the bottom of the hill. We have gravitated there in the evening sunshine to stand at the bottom of the slope and marvel. The trees have been drawn up tall and slender and the froth of creamy flowers brightening the shadows of the newly sprung wood. 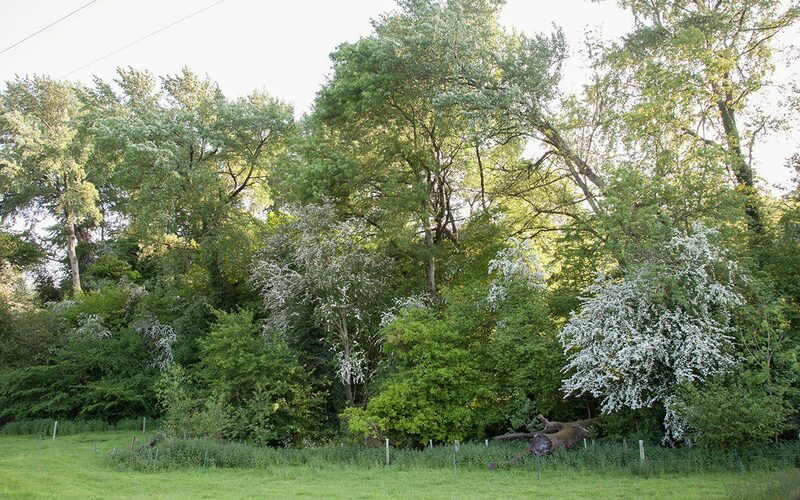 At the margins of the wood, their favoured place, the branches push out wide and low, a hum of insects enticed by an uncountable sum of flower.The hawthorns saw the apples come and go and now they are starting to dim, it is summer. Why they were as weighted so heavily with flower this year I do not know, but it is the best they have been since we arrived here and I am pleased I have planted them as plentifully. Haw, May, Quick, Quickset; hawthorn is a tree surrounded in folklore. Cut one and you will be plagued by fairies, but turn the milk with a twig before churning and you will protect the cheese from bewitchment. According to Teutonic legend, the tree originated from a bolt of lightning, which is why the wood was used on funeral pyres. The power of the sacred fire was sure to ferry your spirit to heaven. In ancient rituals the hawthorn symbolised the renewal of nature and fertility, which often made it the choice for a maypole at Beltane. The wood itself is one of the hardest and often used for fine engraving and the young leaves are surprisingly delicious in a salad, with a fresh nutty taste. The flowers, however, smell both sweet and stale. Some find this unpleasant, but to my nose it is just a country smell, which attracts flies and insects that lay their eggs on decaying animal matter. Crataegus is well known for the diversity of species that live within the thorny cage of its branches or on the bark or the foliage so, despite the superstition around it, it is a mainstay of the countryside. I have relied upon it as the greater component when replanting my native mixed hedges. It is called Quick with good reason and the hedges that I planted to gap up our broken boundaries five years ago are already six feet high, thick and impenetrable. I wonder how elderly some of the thorns are in the oldest of the hedges here. It is estimated that 200,000 miles of them were planted between 1750 and 1850 as a result of the Enclosure Acts. During this time there were nurseries committed to growing the hawthorn in quantity to meet the demand, and making a small fortune from the supply. If you leave your hedges and cut them year on, year off, the hawthorn flowers and fruits more heavily. Leave a tree free-standing and it will be reliably heavy with dark red berry in October. The berry is the way to propagate. I leave them for as long as I dare before taking my share, for the birds will suddenly strip a tree when the fruits ripen. The digestive juices of birds help to break the inbuilt dormancy of the seed, but you can simulate this by leaving the berries to ferment for a week in water before lining out in a drill in the garden. Some may germinate the following year after the action of frost has worked its magic, but two years of stratification may be required before you get a full row to germinate. Within a year of germinating you will have young plants a foot or so tall, in two whips ready to make a hedge. Or the beginnings of a maypole.